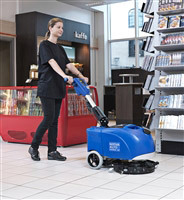 The purchase of a scrubber is often a headache for the user in view of the wide choice on the market. Several criteria are to be taken into account at the time of purchase. 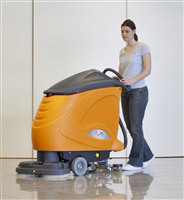 What is the size of the surface to be treated with the scrubber and especially the time you want to spend. The type of so l (tiling, thermoplastic ...). The accessibility of the surface to clean. The analysis of these criteria will already allow you to know if you wish to orient yourself on a battery scrubber or on a scrubber machine with cable. The interest of a battery scrubber is its increased mobility but with a higher maintenance constraint (load management, replacement of batteries). In addition, a battery scrubber has the main objective of maintaining a minimum of autonomy and therefore a concession is generally made on the power available in brush cut and suction. A battery model is therefore generally a less powerful equivalent model. 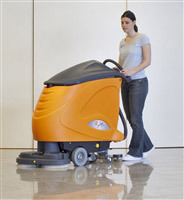 A cable scrubber will be less expensive to purchase and will be easier to maintain but the premises must be suitable for handling the cable. You must therefore have holdings on a regular basis. 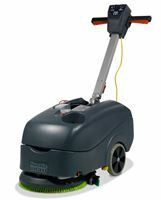 The power of the machine in terms of torque and suction will be greater than its battery equivalent. The work method will require working progressively away from the socket to avoid a cable crossover. The size of the surface and the time allowed for the treated will determine the working width of the scrubber and thus its performance in terms of m2 / hour. Pay attention to the announced yield values which are generally theoretical returns . This theoretical output is a simple mathematical formula that multiplies the working width of the machine by the speed of advancement of a man on foot. 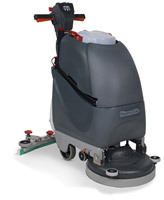 Some scrubber makers provide a practical performance that matches the actual performance. In most cases, retaining a practical efficiency of 50% lower than the theoretical output can be a conservative rule that will avoid any inconvenience (under-sized machine). 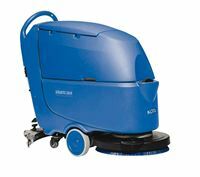 Example: If you want to clean 2000 m2 in 2 hours, you will have to choose a scrubber with a practical efficiency superior to 1000 m2 / hour corresponding to a theoretical output of 2000 m2 / hour. 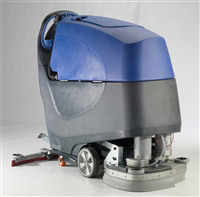 In the case of very large surface, a so-called self-winding scrubber may be required. 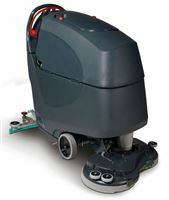 The scrubber can have a drive at the wheels and in this case we speak of a self-propelled scrubber . 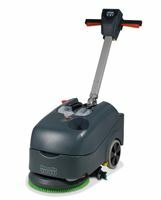 In the case where the scrubber does not have this traction (for smaller models) it is the rotation of the brushes added to the push of the user that allows the machine to advance. The towed machines must be reserved for the use of important models and also configurations of premises presenting for example ramps (handicap wheelchair access) where traction will become necessary. 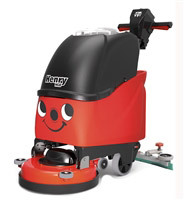 A self-propelled model generally has an additional motor for driving the wheels of the machine. Therefore the autonomy if we are in the case of a battery machine will be reduced or it will compensate with sufficient battery amperage. 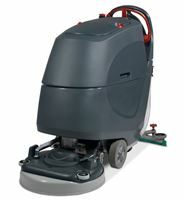 This is the model of scrubber with the highest productivity in terms of mechanical performance but also human. 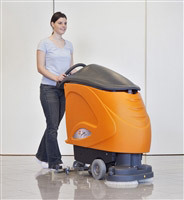 Indeed, as its name suggests, a self-propelled scrubber carries its driver. This obviously generates a huge gain on large surfaces in terms of ergonomics and fatigue of the maintenance agent. 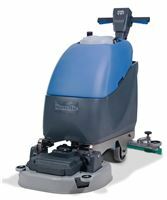 On this type of machine the driver is generally seated but there are models where the driver is standing on a platform attached to the machine as the Taski Swingo XP for example. 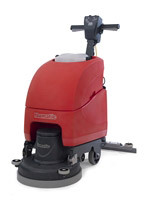 In general, scrubbers are used and delivered with nylon brushes. These brushes are used to treat washable hard surfaces such as tiles, concrete floors, marble, painted concrete, etc. Then there are trays "door disc" or "door pad" whose function is to be able to adapt abrasive discs of different colors (and thus abrasiveness) in order to treat the grounds (in particular the vinyls, linos ... etc) so more adapted.